Studio-6 hour(s). Prerequisite(s): DES 001; (DES 014 or DES 021); DES 015; DES 016. Pass One restricted to Design Majors. Conceptual approaches, technical practice for interactive media using the front-end stack (html, css, js). Conceptual framework, user experience, visual interface and interaction design. Research and written pre-production materials required. Check here for additional information about our courses, including course flyers, special projects, and photo galleries. Click here for expanded course descriptions. Studio—4 hours; lecture/discussion—2 hours. Prerequisite: DES 1 (may be taken concurrently) or consent of instructor; students with a background in drawing or Advanced Placement Art Studio units are encouraged to submit a portfolio for review to waive this course. Priority given to Design majors. Drawing as a tool for design. Basic skills in objective observation and representation, including line, shape, tone, and space. Drawing as a tool for formulating and working through design problems. Studio—4 hours; lecture/discussion—2 hours. Prerequisite: DES 1 (may be taken concurrently) or consent of instructor. Priority given to Design students. Introduction to digital tools with emphasis on graphic design including theory, practice and technology. Includes principles of color, resolution, pixels, vectors, image enhancement, layout, visual organization, visual hierarchy, typography. Studio—4 hours; lecture/discussion—2 hours. Prerequisite: DES 1 (may be taken concurrently) or consent of instructor. Priority given to Design majors. Introduction to mechanical drafting, including scaled drawing, orthogonal projection, isometric, axonometric and perspective. Includes basic rendering techniques. Lecture—3 hours; discussion—1 hour. No prerequisites. Priority to Design majors. Global history of design across time, viewed through the lens of the effects of the creation and discovery of new energy sources, processes and materials on design. Not open for credit to students who have taken course 40 or 140. Lecture—3 hours; discussion—1 hour. No prerequisites. Priority to Design majors. Introduction to the history and theory of design in particular relation to political, philosophical, cultural, economic, and environmental debates and objectives. Lecture—3 hours; discussion—1 hour. No prerequisites. Priority to Design majors. Global historical survey of design’s engagement with changing notions of aesthetics and experience. Relates transformations in the theory, production, and reception of all aspects of design (objects, landscapes, architectures, etc.) to larger cultural, social, and political contexts. Not open for credit to students who have taken course 40 or 140. Studio—4 hours; lecture/discussion—2 hours. Prerequisite: DES 1 or consent of instructor. Priority given to Design majors. Design concept development and detailing as it relates to the making of objects, structures and models using form, scale and materials. Product design and rapid prototyping methods using a range of techniques for advancing the design process. Studio—4 hours; lecture/discussion—2 hours. Prerequisite: DES 1 (may be taken concurrently) or consent of instructor. Introduction to diverse methods for creating textile structures. 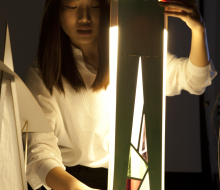 Exploration of the creative potential of hand-constructed textiles, manipulation of fabric to create dimensional surfaces, and the basics of building and joining fabric structures. Only two units of credit to students who have completed courses 23 or 24. Not open for credit for students who have completed both 23 and 24. Studio—4 hours; lecture/discussion—2 hours. Prerequisite: DES 1 (may be taken concurrently) or consent of instructor. Priority given to Design majors. Study and practice of designing clothing for the human body. Emphasis on flat pattern development, structural joining sequences and the development of three-dimensional garments from two-dimensional drawings. Not open for credit to students who have completed course 77A. Studio—4 hours; lecture/discussion—2 hours. Prerequisite: DES 1, 14 (or 21), 15, 16, 77 or consent of instructor. Priority given to Design majors. Advanced study and practice of designing clothing for the human body through pattern development and structural joining. Emphasis on draping techniques and advanced conceptualization for fashion design. Not open for credit to students who have taken course 77B. Studio—4 hours; lecture/discussion—2 hours. Prerequisite: DES 1, 15, 16 or consent of instructor. Pass One priority to Design majors. Programming concepts and skills as applied for visual design. Algorithm-based design and development, flowcharts, pseudo-code, entry level scripting or programming. Principles of coding, logic, syntax, structure. Analysis of historical examples of code-based design. Development, iteration, presentation of design projects. Studio-6 hour(s). Prerequisite(s): DES 001; (DES 014 or DES 021); DES 015; DES 016. Pass One restricted to Design Majors. Conceptual approaches, technical practice for interactive media using the front-end stack (html, css, js). Conceptual framework, user experience, visual interface and interaction design. Research and written pre-production materials required. May be repeated up to 1 Time(s). GE credit: AH. Effective: 2018 Fall Quarter. Studio—4 hours; lecture/discussion—2 hours. Prerequisite: DES 1, 14 (or 21), 15, 16 or consent of instructor. Pass One priority given to Design majors. Visual communication and digital imaging techniques using black and white, and color. Critical analysis of photographs and the role of photography in society combining theoretical perspectives with practical applications. Explore use and meaning of single, sequence, and single composite images.